Objective: To discover the mechanism behind ameliorative effects of Michelia champaca (M. champaca) in gastrointestinal, respiratory and cardiovascular disorders. Methods: Anti- spasmodic potential was evaluated by trying the M. champaca extract (aqueous:ethanolic) on rabbit aorta, trachea and jejunum in vitro. Isotonic and isometric transducers coupled with Power Lab data acquisition system was used to record the responses of isolated tissues. Results: M. champaca extract relaxed the spontaneous and high K+ (80 mmol/L)-induced contractions of isolated jejunum preparation of rabbit showing a Ca2+ channel blocking mechanism. Moreover, extract shifted calcium concentration response curves towards right like standard calcium channel blocker verapamil. In rabbit tracheal preparation, M. champaca relaxed both carbachol (1 1 μmol/L) and high K+-induced contractions, likewise verapamil. In rabbit aorta preparation, M. champaca relaxed phenylephrine (1 μmol/L) and high K+-induced contractions similar to verapamil. Conclusion: M. champaca possesses spasmolytic, airways relaxant and vasodilator actions mediated perhaps due to blocking of Ca2+ channels, hence validating its therapeutic usage in diarrhea, asthma and hypertension. Gastrointestinal, respiratory and cardiovascular diseases are increasing globally. Complementary and alternative medicines are gaining momentum again for treatment of smooth muscle related diseases like asthma, diarrhea, constipation and hypertension. In Pakistan, tribal and rural areas are far from cities, so local people traditionally rely on medicinal plants to cure common diseases. Medicinal plants are valuable because of their safety, efficacy and immunity enhancing effects. Moreover, herbal medicines are free from side-effects as compared to allopathic medicines. Michelia champaca Linn (M. champaca; Magnoliaceae), frequently known as Champak or Golden champa, is a widely used medicinal plant in Pakistan because of its diversity of folk medicinal uses. It is a large evergreen tree widely distributed in Pakistan, Sri Lanka, Nepal, Burma, India, China, Bangladesh, Thailand and Malaysia. M. champaca L. has traditionally been used to treat diarrhea, cough, bronchitis, hypertension, dyspepsia, fever, rheumatism, abscesses, dysmenorrhea and inflammation. It is also used as purgative, expectorant, cardiotonic, digestive, carminative, stomachic, stimulant, diuretic, diaphoretic, antipyretic and astringent. The seeds and fruits are claimed to be useful in psoriasis and for healing cracks in feet,. The plant is scientifically stated to exhibit antipyretic, anti- inflammatory, antioxidant,, antimicrobial, cytotoxic, antidiabetic, and analgesic activities. M. champaca contains various bioactive constituents like alkaloids, saponin, palmitic acid, oleic acid, carbonyl acid and ester, oliveroline, lysicamine, nornuciferine, cyperone, ficaprenolepi-yangambin, pheophytin, aristophyll, michephylla and formylanonaine. M. champaca has great medicinal value as proved by various in vitro and in vivo studies ,,,,. The plant has folkloric reputation of having remedial effects in hypertension, asthma and diarrhea, but scientific evidence for its conventional medicinal usage is lacking so far. As part of our research group continuous studies regarding rationalization of ethnopharmacological potential of extracts of medicinal plants of Pakistan ,,,, effects of crude extract of M. champaca were assessed in isolated tissues of rabbit (aorta, trachea and jejunum) to validate its usage in gastrointestinal, respiratory and cardiovascular diseases. M. chamapca (whole plant) was collected in August 2012 from Pattoki, Pakistan and was authenticated by well-known botanist with Voucher Specimen No. Fl. Pak.283. The plant material was extracted as per reported methods. About 950 g of plant substance was drenched with aqueous ethanol (70%) at 37 °C in closed amber colored bottle for 10 d with 3 or 4 times mixing. The soaked substance was first filtered from muslin cloth subsequent from Whatmann-1 filter paper. The filtrate was vaporized to get a thick, semisolid mass which was then transferred to Petri dish More Details and placed at room temperature to remove remaining solvent. Triple maceration was followed by the same method as described above. Phenylephrine, magnesium chloride, potassium chloride, verapamil hydrochloride, ethylene diamine tetra-acetic acid (ETDA) and carbachol (CCh) were purchased from Sigma Chemicals Co. (St Louis, MO, USA). Supplier of potassium di hydrogen phosphate, glucose, magnesium sulphate, calcium chloride, and other required chemicals as reported in our previous findings ,,, was Merck (Germany) and BDH (England). The white albino rabbits (male and female) of weight (1.0–1.8 kg) and 6–7 months in age were used in these experiments. The conditions for animals were the same as described in our previous research papers ,,,. Experiments done fulfilled the verdicts of the Institute of Laboratory Animal Resources, Commission on Life Sciences, National Research Council approved by institutional Ethical Committee of B.Z.U, Multan with EC/09/2011 dated 16-02-2011. Crude extract of M. champaca was initially tested for the existence of alkaloids, coumarins, flavonoids, tannins, phenols, sterols, saponins, terpenes and anthraquinones. High-performance liquid chromatography (HPLC) studies of extract were performed to get fingerprint of various chemical constituents present. M. champaca extracts were hydrolyzed by a previously reported method. Separated phenolic acids were detected by UV-visible detector (SPD-10AV) at 280 nm and were identified by comparing their retention time with standards. Rabbit jejunum, trachea and thoracic aorta were dissected out and prepared for experiments as discussed as previously reported by our research group ,,,. The standard drug used was verapamil hydrochloride for trachea detection. Sustained contractions were produced by phenylephrine in an aggregate approach in isolated aortic tissues. Calcium antagonist activity was evaluated as per our previously reported methods ,,,. Positive control used was verapamil hydrochloride. The results for bronchorelaxant, spasmolytic, and vasorelaxant potential are shown as mean ± standard error of mean (SEM; n=number of experiments) and median effective concentration (EC50) with 95% confidence interval (95% CI). Concentration-response curves were calculated by applying non-linear regression sigmoidal response curve with variable slope using software Graph Pad Prism program version 5.0 for Windows. Chemical analysis of M. champaca extract showed existence of saponins, alkaloids, terpenes, sterols, anthraquinones, tannins, phenols and absence of coumarins, flavonoids and cardiac glycosides among aqueous:ethanolic extractable constituents. Phenolic acid (mg/g of plant extract) determined by HPLC are: chromotropic acid (3.09), quercetin (0.29), gallic acid (1.21), caffeic acid (0.78), chlorogenic acid (2.63), syringic acid (0.17), coumeric acid (2.45) and sinapic acid (1.30). M. champaca inhibited normal impulsive contraction of the jejunum at dose range of 0.1–3.0 mg/mL with relevant EC50 of 0.290 mg/mL (95% CI: 0.183–0.458 mg/mL). It completely calmed K+-induced shrinkage at 3.0 mg/mL with relevant EC50 of 1.410 mg/mL. Verapamil (Standard drug) showed an analogous outline of repression of the spontaneous and K+-induced shrinkages with relevant EC50 of 0.266 (μmol/L (95% CI: 0.179–0.397 μmol/L, n=5) and 0.180 (μmol/L (95% CI: 0.129–0.252 (μmol/L, n=5) [Figure 1], respectively. 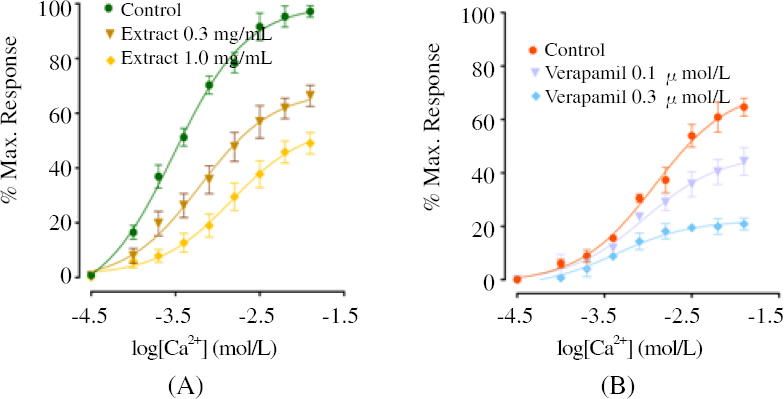 Moreover, M. champaca extract (0.3–1.0 mg/mL) tilted the Ca2+ concentration-response curves likewise verapamil towards right (0.1–0.3 μmo1/L) [Figure 2]. Figure 1: Effect of aqueous-ethanolic extract of M. champaca (A) and verapamil (B) on spontaneous and K+ (80 mmol/L)-induced contraction in isolated rabbit jejunum preparation. Values are expressed as the mean ± SEM (n=5). Figure 2: Effect of aqueous-ethanolic extract of M. champaca (A) and verapamil (B) on concentration-response curve of Ca2+ in isolated rabbit jejunum preparations. M. champaca relaxed CCh-induced contraction of tracheal preparation at dose of 0.03–3 mg/mL with EC50 of 0.457 mg/mL (95% CI: 0.319–0.653 mg/mL) and K+-induced contraction at similar dose (0.03–3.0 mg/mL) with relevant EC50 of 0.931 mg/mL (95% CI: 0.617-1.405 mg/mL, n=5) respectively. Likewise verapamil produced relaxation of CCh- and K +-induced contractions with relevant EC50 of 0.133 μmo1/L (95% CI: 0.089-0.197 μmo1/L) and 0.133 μmo1/L respectively [Figure 3]. 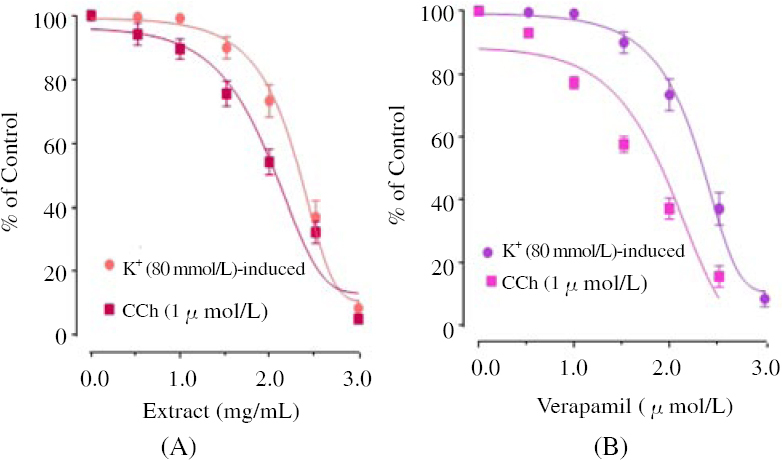 Figure 3: Effect of aqueous-ethanolic extract of M. champaca (A) and verapamil (B) on carbachol (CCh, 1 μmo1/L) and K+ (80 mmol/L)-induced contractions in isolated rabbit tracheal preparation. M. champaca completely relaxed both K+- and phenylephrine- induced contractions at dose range of 0.01–3.0 mg/mL with relevant EC50 of 0.460 mg/mL (95% CI: 0.322–0.657 mg/mL) and 0.362 mg/mL (95% CI: 0.362–0.813 mg/mL, n=5) respectively. Likewise, phenylephrine- and K +-induced contractions were relaxed by verapamil with EC50 of 0.359 μmo1/L and (95% CI: 0.2520.510 μmo1/L) and 0.056 μmo1/L (95% CI: 0.056–0.154 μmo1/L) respectively [Figure 4]. 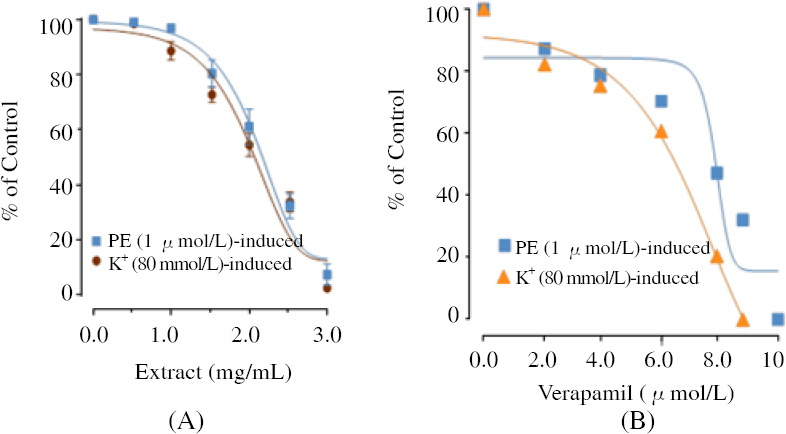 Figure 4: Effect of aqueous-ethanolic extract of M. champaca (A) and verapamil (B) on phenylephrine (PE, 1 |jmo1/L) and K+ (80 mmol/L)-induced contraction in isolated rabbit aorta preparation. Currently, functional foods and herbal supplements are focus of research due to their proved effects on human health. The grey area between plants and medicine is vanishing rapidly and it is becoming impossible to draw a line between plants and medicines. In both developing and developed countries, a large number of medicines derived from natural sources are used in health care systems. The traditional uses of medicinal plants in healthcare practices provide tips for new areas of research and become popular in curing disease. The medicinal and food plants of Pakistan have shown significant benefits to treat the gastrointestinal, respiratory and cardiovascular diseases ,,,. M. champaca has a traditional fame to provide relief in hyperactive condition of gastrointestinal system such as diarrhea, hence aqueous-ethanoic extract of M. champaca was checked on spontaneous rhythmic contractions of isolated jejunum preparation to determine possible antispasmodic action. HPLC method is one of the most important, authentic, fast and reliable methods for identification of phenolic compounds. Therefore in present study, crude extracts were analyzed for presence of various phenolic compounds. The results suggest that chromtropic acid is present in highest amount while syringic acid is present in lowest amount in sample. The plant extract showed antispasmodic effect by preventing spontaneous contractions. The contraction in smooth muscle is because of increased quantity of free calcium in cytoplasm. This increased concentration in the cell is by virtue of either through opening of L-type voltage- reliant-Ca2+ channels or discharged from intracellular reservoirs in sarcoplasmic reticulum ,,,. The impulsive rhythmic movements of the jejunum are coordinated by action potential that is because of uninterrupted depolarization and reploarization. Depolarization shows that the action capacity produced due to inflow of calcium by L-type Ca2+ channels. The subsequent stoppage of the impulsive contractions in jejunum can be because of hindrance either with entry of Ca2+ via voltage dependent Ca2+ channels or Ca2+ discharged from intracellular supplies. To investigate the mode of this finding, crude extract of M. champaca was tried on high K+-induced (80 mmol/L) contraction in jejunum. Contact with K+ (80mmol/L), caused persistent depolarization with high conductance of Ca2+ towards cell through voltage dependent Ca2+ channels, raised intracellular Ca2+ and greatly depolarized cell membrane resulted in spasmogenic contraction,. The M. champaca repolarized the membrane potential by obstruction of Ca2+ current inflow, hence showing its relaxant or spamsolytic activity. Substances competent to prevent K+ (80 mmol/L)- induced contraction are thought to be calcium channel blockers. It was expected following series of events were inhibited, i.e., i.) reduced cytosolic Ca2+ ions concentration, ii) inhibition of Ca2+ attachment on calmodulin, thus calcium-calmodulin complex did not materiliaze, iii) reduced instigation of myosin light chain kinase, so phosphorylation of myosin light chain could not happen, and iv) reduced contact between actin and myosin so contractile response was not created,. The Ca2+ antagonistic action of M. champaca was further verified due to shifting of the Ca2+ concentrations response curves rightward on jejunum preparation which is analogues to verapamil (a standard calcium channel blocker). The calcium channel blockers are proven remedial class, the mutual property of which is dose-dependent impediment of the sluggish flow of Ca2+ and U-turning of the action to Ca2+. M. champaca also has traditional uses also in respiratory disorders, i.e., bronchitis, cough and expectoration. Its aqueous-ethanolic extract demonstrated relaxant action on carbachol (1 μmol/L)- and high K+-induced contractions in trachea analogous to verapamil. Carbachol belongs to class of cholinergic drugs and act on Gq- coupled muscarinic M3 receptors which facilitates signaling transduction for discharge of intracellular calcium ions from calcium stores, and causes contraction by different pathways. The M. champaca exerts its bronchodilator action by antagonized Gq coupled muscarinic M3 receptor and blockades the signal transduction of muscarinic receptor pathway of contractile response. The relaxation of high K+-induced contraction shows its Ca2+ channel blockade effect. Hence the relaxant result observed is probably referred as Ca2+ channel inhibiting mechanism. The Ca2+ channel inhibitors are very important in airway hyperactivity and indication of this activity can justify the conventional use of the plant in airways diseases. The airways diseases are etiologically related to vasospastic disorders, so extract of M. champaca was assessed for its potential vasorelaxant capacity. It indicated relaxation of phenylephrine and high K+-induced contractions in rabbit aorta comparable to verapamil. The phenylephrine-induced contraction of aorta is because of enhanced cytosolic calcium via both Ca2+ entry through receptor operated channels and calcium released from intracellular reservoirs. Earlier it was discovered that membrane depolarization causes high K+-induced contraction in vascular smooth muscle resulting in increased calcium entry perhaps through T- or L-category of calcium channels,. Hence, it may be opined that relaxation of both high K+-induced and phenylephrine contractions by crude extract of M. champaca is due to calcium channel blocking mechanism. The M. champaca displayed calcium channel blocker capacity in-vitro on aorta, trachea and jejunum that may be credited to the existence of alkaloids, flavonoids and tannins amongst the constituents of M. champaca noticed in chemical screening. The crude extract of M. champaca has shown spasmolytic, airways- relaxing and vasodilating potential which can be ascribed to presence of calcium channels blocking activity. The study therefore rationalizes its traditional usage in hypertension, diarrhea, and asthma in conventional systems of medicine. Kiritikar KR, Basu BD. Indian medicinal plants. Dehredun: International Booksellers and Publishers; 1999. Prajapati ND, Purohit SS, Sharma AK, Kumar T. A handbook of medicinal plants. Jodhpur: Agrobios; 2003. Vimala R, Nagarajan S, Alam M, Susan T, Joy S. Anti-inflammatory and antipyretic activity of Micheliac hampaca Linn., (white variety), Ixorabra chiata Roxb. and Rhynchosia cana (Willd.) D.C. flower extract. Indian J Exp Biol 1997; 35 (12): 1310-1314. Nickavar B, Kamalinejad M, Haj-Yahya M, Shafaghi B. Comparison of the free radical scavenging activity of six Iranian Achillea species. Pharm Biol 2006; 44 (3): 208-212. Hossain MM, Jahangir J, Hasan SMR, Akter R, Ahmed T, Islam MI, et al. Antioxidant, analgesic and cytotoxic activity of Linn. leaf. Stamford J Pharm Sci 2009; 2 (2): 1-7. Khan MR, Kihara M, Omoloso AD. Antimicrobial activity of Michelia champaca. Fitoterapia 2002; 73 (7-8): 744-748. Hoffmann JJ, Torrance SJ, Widehopf RM, Cole JR. Cytotoxic agents from Michelia champaca and Talauma ovata: Parthenolide and costunolide. J Pharm Sci 1977; 66 (6): 883-884. Jarald EE, Joshi SB, Jain DC. Antidiabetic activity of flower buds of Michelia champaca Linn. Indian J Pharmacol 2008; 40 (6): 256-260. Wang HM, Lo WL, Huang LY, Wang YD, Chen CY. Chemical constituents from the leaves of Michelia alba. Nat Prod Res 2010; 24 (5): 398-406. Suralkar AA, Tayade GV, Dose RS. Michelia champaca: A useful remedy for mast cell stabilization, antiallergic and anaphylactic activity in management of asthma. World J Pharma Sci 2015; 4 (5): 1207-1213. Akram M, Usmanghani K, Ahmed I, Azhar I, Hamid A. Comprehensive review on therapeutic strategies of gouty arthritis. Pak J Pharm Sci 2014; 27 (5): 1575-1582. Fan G, Han BH, Kang Y, Park MK. Evaluation of inhibitory potential of Chinese medicinal plants on platelet-activating factor (PAF) receptor binding. Nat Prod Res 2001; 7 (2): 33-37. Aruna G, Praveenkumar A, Munisekhar P. Review on Michelia champaca Linn. Int J Phytopharm Res 2012; 3 (9): 32-34. Ananthi T, Barvin IJ, Chitra M. Antihyperlipidemic activity of Michelia champaca L. in triton wr 1339 induced albino rats. Int J PharmTech Res 2014; 6 (4): 1368-1373. Janbaz KH, Javed S, Saqib F, Imran I, Zia-Ul-Haq M, De Feo V. Validation of ethnopharmacological uses of Heliotropium strigosum Willd. as spasmolytic, bronchodilator and vasorelaxant remedy. BMC Comp Alt Med 2015; 15 (1): 169-175. Janbaz KH, Qayyum A, Saqib F, Imran I, Zia-Ul-Haq M, De Feo V. Bronchodilator, vasodilator and spasmolytic activities of Cymbopogon martini. J Phys Pharm 2014; 65 (6): 859-866. Janbaz KH, Nisa M, Saqib F, Imran I, Zia-Ul-Haq M, De Feo V. Bronchodilator, vasodilator and spasmolytic activities of methanolic extract of Myrtus communis L. J Phys Pharm 2013; 64 (4): 479-484. Janbaz KH, Latif MF, Saqib F, Imran I, Zia-Ul-Haq M, De Feo V. Pharmacological effects of Lactuca serriola L in experimental model of gastrointestinal, respiratory and vascular ailments. Evidence-Based Comp Alt Med 2013; 2013: 1-9. Zia-Ul-Haq M, Ahmad S, Bukhari SA, Amarowicz R, Ercisli S, Jaafar HZE. Compositional studies and biological activities of some mash bean (Vigna mungo (L.) Hepper) cultivars commonly consumed in Pakistan. Bio Res 2015; 47 (3): 23-37. National Research Council. Guide for the care and use of laboratory animals. Washington DC: National Academy Press; 1996. Tona L, Kambu K, Ngimbi N, Vlitinck AJ. Antiamoebic and phytochemical screening of some Congolese medicinal plants. J Ethnopharmacol 1998; 61 (1): 57-65. Dek MSP, Osman A, Sahib NG, Saari N, Markom M, Hamid AA, et al. Effects of extraction techniques on phenolic components and antioxidant activity of Mengkudu (Morinda citrifolia L.) leaf extracts. J Med Plant Res 2011; 5 (20): 5050-5057. Janbaz KH, Arif J, Saqib F, Imran I, Ashraf M, Zia-Ul-Haq M, et al. In- vitro and in-vivo validation of ethnopharmacological uses of methanol extract of Isodon rugosus Wall. ex Benth. (Lamiaceae). BMC Comp Alternat Med 2014; 14 (3): 71-83. Saqib F, Janbaz KH. Rationalizing ethnopharmacological uses of Alternanthera sessilis: A folk medicinal plant of Pakistan to manage diarrhea, asthma and hypertension. J Ethnopharmacol 2016; 182 (11): 110-121. Janbaz KH, Ahsan MZ, Saqib F, Imran I, Zia-Ul-Haq M, Rashid MA, et al. Scientific basis for use of Solena heterophylla Lour. in gastrointestinal, respiratory and vascular disorders. J Transl Med 2015; 13: 134-142. Janbaz KH, Ahsan MZ, Saqib F, Imran I, Zia-Ul-Haq M, Rashid MA, et al. Scientific basis for use of Pyrus pashia Buch.-Ham. ex D. Don. fruit in gastrointestinal, respiratory and cardiovascular ailments. PLos One 2015; 10 (3): e0118605. Farre AJ, Columbo M, Fort M, Gutierrez B. Differential effects of various Ca++ antagonists. Gen Pharm 1991; 22 (1): 177-181. Van-Rossum JM. Cumulative concentration-response curves II: Techniques for the making of concentration-response curves in isolated organs and the evaluation of drug parameters. Arch Int de Pharmacodynamie 1963; 143 (2): 299-330. Janbaz KH, Saqib F. Pharmacological evaluation of Dactyloctenium aegyptium: An indigenous plant used to manage gastrointestinal ailments. Bangla J Pharmacol 2015; 10 (2): 295-302. Brading AF. Tonic distribution and mechanism of transmembrane ion movements in smooth muscle. In: Bulbring E, Brding AF, Jones AW, editors. Smooth muscle. Austin: University of Texas Press; 1981, p. 6592. Bolton TB. Mechanism of action of transmitter and other substances on smooth muscles. Phys Revs 1979; 59 (3): 606-718. Foster RW, Small RC, Weston AH. The spasmogenic action of potassium chloride in guinea-pig trachealis. Br J Pharmacol 1983; 80 (3): 553-559. Godfraind T, Miller R, Wibo M. Calcium antagonist and calcium entry blockade. Pharm Rev 1986; 38 (4): 321-416. Triggle DJ. Calcium-channel antagonists: Mechanisms of action, vascular selectivities, and clinical relevance. Cleveland Clinic J Med 1992; 59 (6): 617-627. Pang S, Tsuchiya S, Horie S, Uchida M, Murayama T, Watanabe K. Enhancement of phenylephrine-induced contraction in the isolated rat aorta with endothelium by H2O-extract from an oriental medicinal plant Leonuri herba. Jpn J Pharm 2001; 86 (2): 215-222. Kitazawa T, Kobayashi S, Horiatis K, Somlyo A. Receptor-coupled, permeabilized smooth muscle. Role of the phosphatidylinositol cascade, G-proteins, and modulation of the contractile response to Ca2+. J Biol Chem 1989; 264 (10): 5339-5342. Karaki H, Ozaki H, Hori M. Calcium movements, distribution and functions in smooth muscle. Pharmacol Rev 1997; 49 (2): 157-230. Matsunami M, Kirishi S, Okui T, Kawabata A. Hydrogen sulfide-induced colonic mucosal cytoprotection involves T-type calcium channel- dependent neuronal excitation in rats. J Phys Pharm 2012; 63 (1): 61-68. Khalid A, Haq Z, Ghayur MN, Feroz F, Rahman A, Gilani AH, et al. Cholinestrase inhibitory and spasmolytic potential of steroidal alkaloids. J Steroid Biochem Mol Biol 2004; 92 (5): 477-484. Revuelta MP, Cantabrana B, Hidalgo A. Depolarization dependent effect of flavonoids in rat uterine smooth muscle contraction elicited by CaCl2. Gen Pharmacol 1997; 29 (5): 847-857. DiCarlo G, Izzo AA, Maiolino P, Mascolo N, Viola P, Diurno MV, et al. Inhibition of intestinal motility and secretion by flavonoids in mice and rats: Structure-activity relationship. J Pharm Pharmacol 1993; 45 (12): 1054-1059.